Review | "Retro" is making a new product in the style of an old one. Underneath such a product is modern, but the outside remains true to the original from the past. Perhaps the best known retro product ever is a car: the Volkswagen Beetle. The original is from 1938 and now there's an all-new Beetle which is still true to its illustrious predecessor. 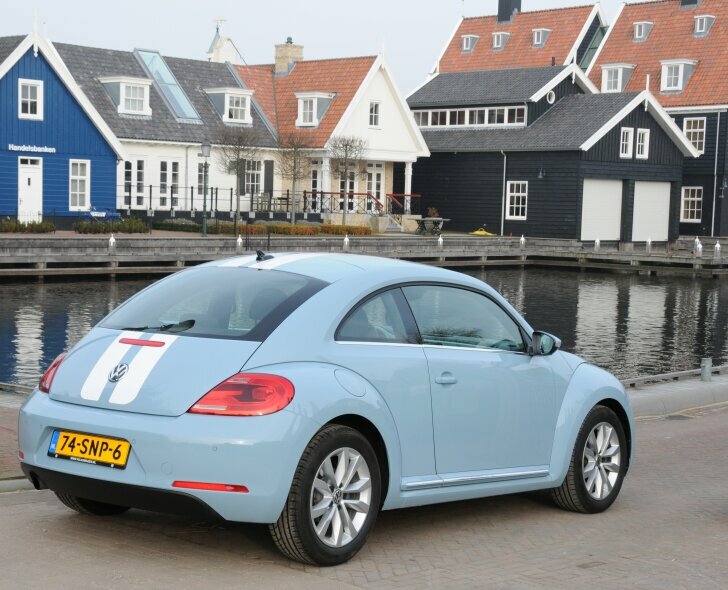 If you like to receive compliments, get yourself a new Volkswagen Beetle. Never before has the test driver been addressed by so many bystanders, all of which spoke very highly about the car. That is, of course, thanks to the sympathetic looks which have characterised the Beetle for decades. Yet, the compliments where more than just: "nice car you have there". The previous incarnation of the Beetle was on sale from 1999 to 2011. As a homage to the original Beetle this car was a success, but from an ergonomical point of view there was much room for improvement. That's because the 1999 model was based on a Golf and the engineers had to work within the limits of that base model. The new Beetle has been designed as a Beetle from the very start, giving the developers more freedom. The best compliment was: "This Beetle oozes the same beauty as a Porsche 911". This is mostly thanks to the more harmonious lines. Starting from scratch also means the cabin space could be used more efficiently. Fitting all necessary mechanics under the skin as efficiently as possible is known as "packaging" in the trade. 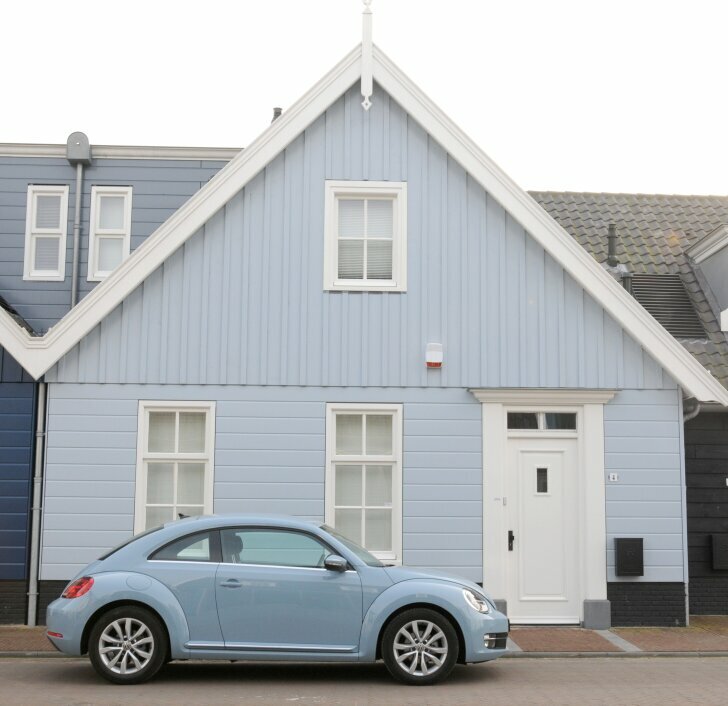 The Beetle has also grown considerably, which also translates into more cabin space. The boot hasn't merely grown, it is also more accessible thanks to the huge back door. Both head and legroom in the rear is poor. The space in the front is fine. Despite the many ways to alter the seat and steering wheel, even after a full week of driving, an ideal sitting position was never found. It is as if the steering wheel and front seat have been placed under an awkward corner. Of course everything about the cabin reflects the past. For example, the dashboard of the "Design" version driven here has been executed in the colour of the car. The steering wheel is bigger and thinner than usual for a modern car, yet not as big or thin that it starts to become unpleasant. The dials are unfashionably large, including a fuel gauge that's bigger than the average rev counter. Those who like to postpone a stop to the fuel station until the very last moment, can drive to the very last drop, thanks to this detailed gauge. On the upper half of the dashboard is a tiny glove compartment with a lid in the colour of the car; exactly like in the original Beetle from last century. To make life easy, there's now a second glove box underneath which offers more storage space. Sadly, the characteristic vase (to put a flower in) from the previous Beetle is missing. "Retro" means old looks in combination with new technology. This is why the 2012 Beetle can be fitted with all creature comforts that may be expected from a modern, mid-sized car. 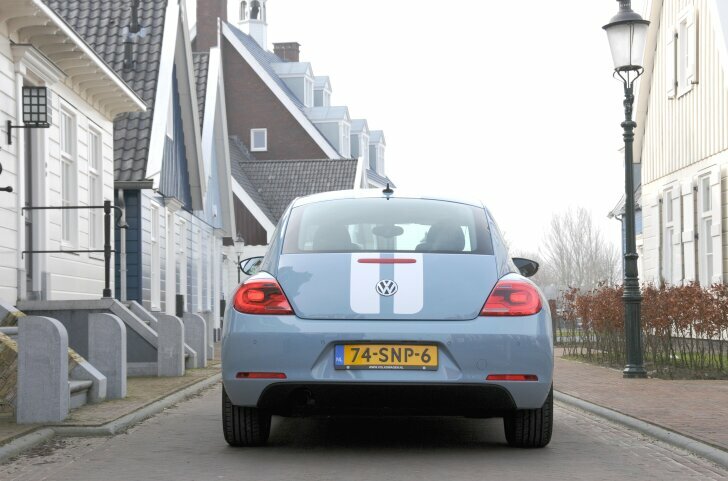 For example, the test car was fitted with the standard Volkswagen audio, communication and navigation system (including a control on the steering wheel and Bluetooth compatibility). The Beetle is also available with a dual zone climate control, headlights that automatically activate in the dark and a trip computer. Because of the odd body shape the optional park distance control is a neccesity rather than a luxury. Yet the Beetle doesn't offer all the technology Volkswagen has to offer. For example, there's no camera that can read traffic signs or warn the driver when unintentionally crosssing road markings. The Beetle doesn't automatically brake for other vehicles (something even Volkswagen's cheapest model can do) nor can it park itself. In short: while the Beetle is modern, it's not innovative. When it comes to the engines, the Beetle is more innovative. This retro model doesn't feature a hybrid engine or other modern trickery; that would put it out of character. 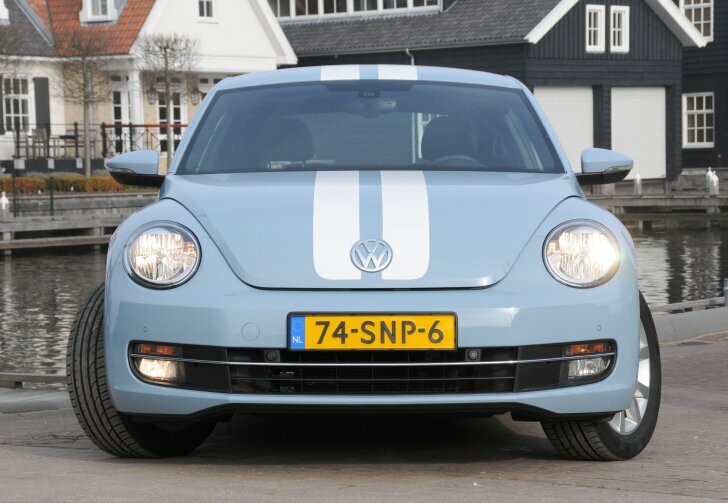 Instead Volkswagen fits the Beetle with the best technology to make a common petrol engine both strong and frugal. Volkswagen's TSI engines offer the best combination of high performance and low emissions available today. Other brands do just as well in theory, but only in theory. Volkswagen engines keep their promises in real life as well. This certainly goes for the "Beetle 1.2 TSI". Despite its relatively small displacement, this engine develops more than enough power (105 PS / 175 Nm). With this base engine under the bonnet the Beetle performs well, can safely overtake slow traffic and never lacks the power to quickly merge with fast moving traffic. In all situations the engine noise is very low. On longer distances, and with a calm driving style, the Beetle 1.2 TSI does 50.4 miles per gallon. Going a bit faster costs about 42 mpg. In city traffic fuel economy isn't as good, because there's no stop/start system. Despite this, difference compared with the ancient Beetle is huge (it did 22 mpg). The tricky handling of the first Beetle (with its engine in the rear like a pendulum) is also a thing of the past. The 2012 Beetle is safe and handles well. Compared to the previous Beetle the improvement is also obvious. The 2012 model feels light and agile, instead of heavy and unwilling. If necessary, the Beetle can be thrashed around the corner and even then the tyres don't make a sound. Still, compared to other cars, driving the Beetle is an especially uneventful experience. And that's exactly how it should be with a retro car: all the good things of today with only the charm of the past. Like no other, Volkswagen understands how to build a retro car. The latest Beetle combines the visual design of the past with today's technology. A retro car should be more fun than just a regular car, yet not as troublesome as a real old-timer or exotic car. 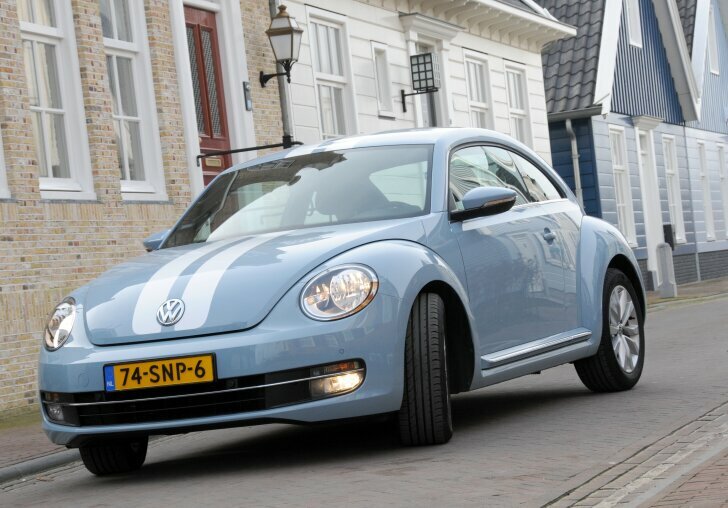 The Volkswagen Beetle 2012 meets all of these demands. 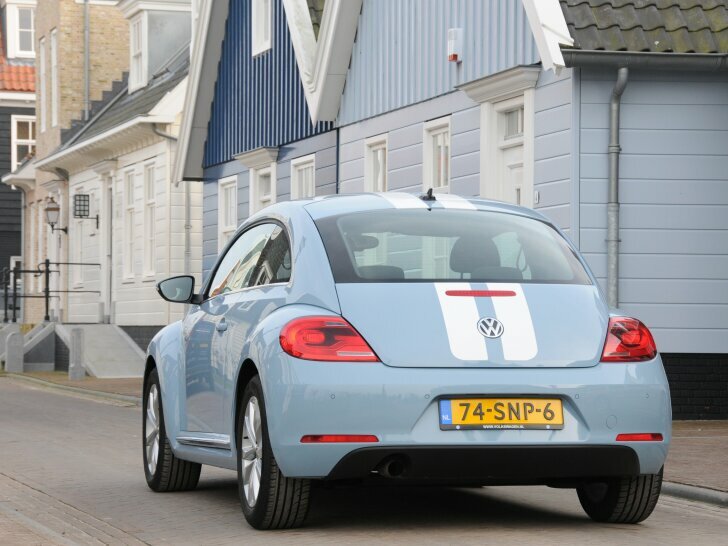 The Beetle is as practical and well-built as any other VW, yet it offers a unique charm. On top of that the Beetle drives very well, is pretty frugal (the "1.2 TSI" model) and offers all luxury and safety equipment one can expect from a modern car.